cash in your Walmart MoneyCard® Vault. Get and Register a Walmart MoneyCard. (Already have a card? Just log in). Log into the Walmart MoneyCard App or Website. Click “STASH” on the MoneyCard Vault, and move any amount from your card balance into the Vault. Bonus: you’re saving up for the future. You’re automatically entered for a chance to win! Earn one sweepstakes entry in the monthly drawing for every dollar on average you saved up in the Vault for that month. Earn up to 500 entries per month.  Winners will be contacted by email each month, and cash prizes automatically deposited on your Walmart MoneyCard. Get and Register a Walmart MoneyCard. (Already have a card? Just log in). Tap “STASH” on the MoneyCard Vault, and move any amount from your card balance into the Vault. Subject to successful verification of identity. NO PURCHASE OR MONEY TRANSFER NECESSARY. The Walmart MoneyCard Prize Savings Sweepstakes starts at 12:00 AM PT on 5/1/18 and ends at 11:59:59 PM PT on 4/30/19. Sweepstakes consists of 12 separate monthly entry periods. Open only to legal residents of the 50 US/DC/PR, 18 years/age of majority in jurisdiction of residence or older. Click HERE for Official Rules, including entry period deadlines, entry instructions, how to enter without making a transfer to a MoneyCard Vault, odds of winning, prize details and restrictions. Void where prohibited. Sponsor: Green Dot Corporation, P.O. Box 5100, Pasadena, CA 91117-0100.